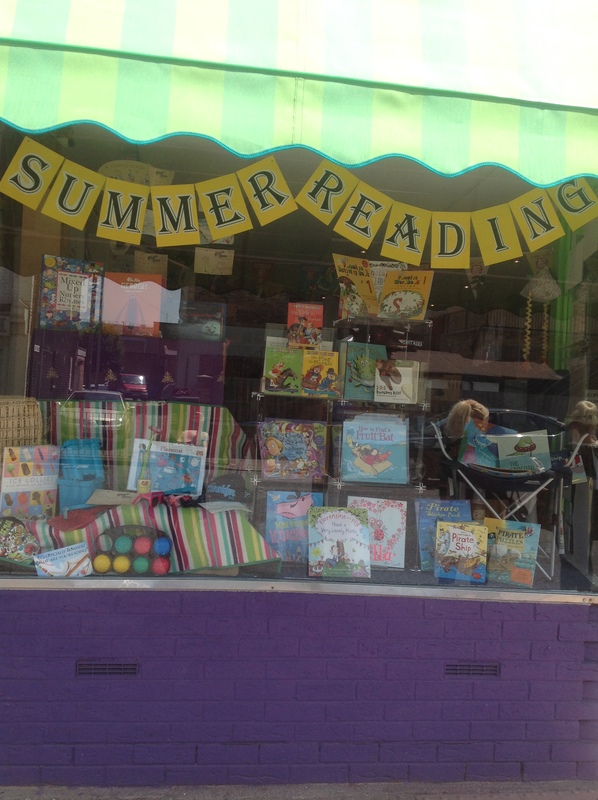 Brentwood's very own independent children's bookshop, tuition centre and cafe corner all under one roof! It encourages us to use our imaginations. It develops reading, writing and learning skills. It can develop self confidence and identity. It teaches empathy, as we place ourselves in someone else’s shoes. It provides an emotional outlet. We already run a weekly Creative Writing Club, which is very informal – there are no red marking pens! The children are encouraged to try out their ideas, often pictorially to begin with, in a relaxed environment. The class is for children who are capable writers already, but find it difficult to ignite their creative spark. As with all of our tuition, classes are £16.50 for 50 minutes, paid weekly in advance. However, if you book and pay for a term in advance, we are offering one free lesson. This is non-transferable and refundable. As the first block is just a half term, the offer is £16.50 weekly or £107.25 for the half term (one lesson at half price). This February will see the first ever Harry Potter Book Night. This exciting event gives new and existing fans a chance to share the wonder of J.K. Rowling’s unforgettable stories and, most excitingly, to introduce the next generation of readers to the unparalleled magic of Harry Potter. You are hereby invited to embrace the magic and banish the midwinter blues! Our event is taking place on Saturday 7th February, 16:00-17:30, combining a love of Harry with our regular Creative Writing Club. It’s free and suitable for ages 6+. There’s no need to book in. You are encouraged to dress up though! 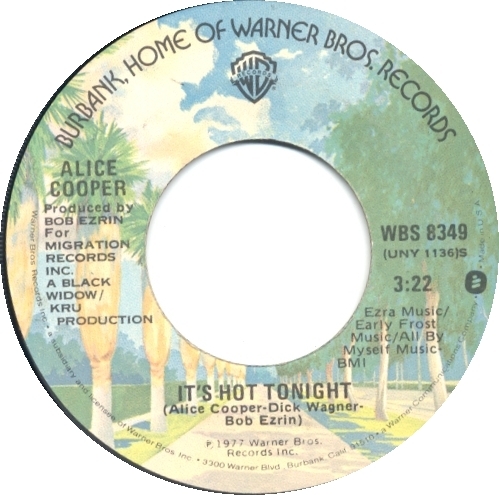 Too hot for talkin’…I think I’m on Alice Cooper overload at the moment, but his songs fit so perfectly that I just can’t help myself. But this Saturday we are planning a little treat for you by replacing some of our glorious books with the equally glorious Russell Newton. I’ve had this crazy idea you see and because Russell is so lovely, instead of running for the hills, he has agreed. Will he ever learn? Russell runs a super duper art club on Saturday during term time (13:00-14:30, for just £8), as well as holidays sessions whenever school has kicked out. My cunning plan is this. On Saturday, Russell, along with some happy volunteers, shall become our artist in residence. Quite literally in residence, in our window. You can come and witness the madness/creativity, from 12:30 and then join Russell for an art class (not in the window). There’s no need to book in for Russell during term time, but if you want to come along in the holidays, you will need to secure your place. What is creative writing and how do you encourage/coax your child into getting involved? All too often at school the creativity kind of gets sucked out of you. Not at my school obviously, because we have a brilliant creative curriculum which very much has our children in mind. But, what if that isn’t the case, then what? There’s nothing worse than being confronted with an A4 blank sheet of paper, when you have no ideas and/or enthusiasm. So I thought I’d share a couple of the things that I do, in the classroom and also at Chicken and Frog during Creative Writing Club. One very simple tool is story cubes. They are superb in my opinion. If you’re going on a long journey, there is an app version too, which saves you scrabbling around on the floor in search of lost dice. There are different ways of using the cubes. 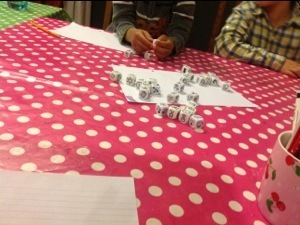 The children can take it in turns to create a part of the story, using the dice for inspiration. Or roll all of the dice in a set and link the images together to form a story. The challenge level can be raised or lowered according to the ability of the child. I firmly believe that if you can’t say it, you can’t write it, so story cubes are the perfect way in for oral rehearsal of ideas. My second secret weapon is Lego. I can not stress how heavily Lego features in my life. It is ace! 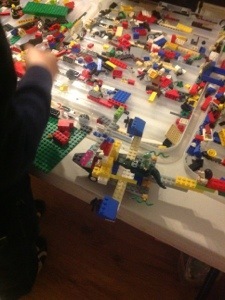 Boys respond particularly well to Lego, but it works equally well with girls. One great activity is to give the children some to build…whatever they want. As they build, talk and then talk some more. Ask questions and if the answers are lacking in detail, ask some more. This is a sneaky approach to writing, as it is rather a covert operation. Once the building phase is complete, encourage the children to ask each other questions about what they have made. Then comes the writing. It can take on a range of genres: an interview, instructions, a story about the structure or creature…the possibilities are endless. The final way in to writing that I want to share with you today is film. Children love film and T.V., so why not use it to your advantage? I find it particularly effective to take a look at clips that are not so familiar, otherwise children tend to just copy what they already know. Anime films are brilliant for character development and are a little different, so work well. You can watch a clip for inspiration, carry on the story or write the back story, create a film script…up to you! We have looked at various versions of the same story to kick off a good discussion, leading into writing reviews or a blog. So there you go, just a few ideas to get your children writing. I know that these ideas aren’t groundbreaking, I’m not that clever, but hopefully they’ll help you to help your child. Go for it, writing can open up a whole world of possibilities. Part of our mission statement for Chicken and Frog is to provide affordable education for the families of our community. To a large degree we have already achieved this, as we run tuition sessions* for just £15, without any scary tie-ins which ask for long-term commitments from parents. Although in an ideal world we would love it if our children received all of the education that they need in school, for a variety of reasons this cannot or is not always the case. We found out first hand how expensive private tuition can be and felt that it would be beneficial to offer an alternative. To this end, we run 4:1 group tuition for a less daunting fee. However, we are all too aware that for many families, the cost is still a barrier. As well as this, some parents need to know how to support their child with school work. I wouldn’t know where to begin if our eldest was struggling with maths and I know that there are other parents out there that feel the same. Mr Frog & Mrs Chicken when eldest Radish needed help with maths! Many schools run one-off literacy or numeracy drop-in sessions for their families, and whilst they are very good, they may not be enough. So what’s the solution? Well, we have come up with a cunning plan to help combat this tricky situation. Our plan began to take shape back in August when we heard about the Brentwood Localism Share Fund. In essence, there is a pot of money which has been ring-fenced for self-sustaining community projects. For example, Claire Mackaness developed the Brentwood Bag Project, using funding from the Council, enabling her to deliver training to local community groups, on how to make and sell bags using re-claimed materials. There are varying rules and regulations around the funding, but the main premise is that the money is used to benefit the community in a long-term, sustainable fashion. Our idea is relatively simple. We will offer ten families (in the first instance), 12 x 1 hour tuition sessions in English or Maths (not both), on a fortnightly basis. For now, we will focus on Key Stage 1 and Key Stage 2 children. In addition to the contact time with the teacher, each family will have access to a chat-room and ‘ask the teacher’ section via our main website. We will also offer a 10% discount on books for the signed up families. The catch? There isn’t one, except that one parent must attend each session with their child. There is no cost to the families involved, unless they choose to buy a book! All we ask is that the families attend their allocated sessions each fortnight. Exciting stuff heh! We are very grateful to the Council for awarding us our bid and are really looking forward to putting our plans into action once the New Year swings into view. We have some great news…well, actually we have two big pieces of news, but I’m only blogging about one of them tonight. As you may already know, I run a ‘Creative Writing Club’ every Saturday afternoon, which is great fun. The sharing of stories through the written word and film, all leads to some wonderful writing from the children. I have been overwhelmed by the response the club has received; it has gone a long way to confirming my faith that children love writing. To celebrate the talent that’s out there, we are running our very own creative writing competition in the New Year. 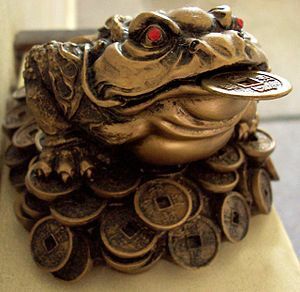 We invite children to write a short story or narrative poem about Mr Frog and Mrs Chicken. The rest is left entirely up to the budding authors. The fabulous J.D.Irwin will be joining us to whittle the entries down to three final winners (one from each of the following Key Stages – KS1, KS2 & KS3). All entries need to be with us by Saturday 26th January, by post, in person or via email: competition@chickenandfrog.co.uk. If you are from a local school and would like to get involved, we can arrange collection of your children’s entries on Friday 25th January. P.S. All entries must include the child’s full name, D.O.B and contact details. Here at Chicken and Frog we always like to provide our customers with whatever they need, from books about lighthouses to a reprinted classic from years gone by. So, when a young man (who aspires to become a firefighter) came in and asked if we could help him brush up for his basic skills test, who was I to say no? I know what you’re thinking; a young firefighter eh, no wonder she said yes. Well, how very dare you! It won’t be me (sadly) who will be delivering the tuition, so you can stop that right now. However, if he chooses to let his fellow colleagues know about us and they happen to visit Chicken and Frog, I will be my usual, hospitable self. There is a serious edge to this blog post dear reader, and that is to let you know in my rambling manner, that as well as 11+, English and Maths (KS1-‘A’ Level) and French Conversation, we now offer basic skills sessions for in adults in English and Maths. Our main time slot will be Thursdays 18.00-19.00, but we can run sessions during the day too if that would suit your needs. The cost is just £15 per hour and all sessions must be pre-booked, as we guarantee no more than four students in a group. I appreciate that it can be difficult as an adult to ask for help when it comes to numeracy and literacy skills, but once you have made that first step there’ll be no looking back. You don’t need to commit to a long costly course and each session will be tailored to support you. All we ask is that after the first session, you book and pay in advance for following sessions.